"No tutorials, no easy mode"
Mad Gear Games has announced that A Hole New World will be arriving on Nintendo Switch on 1st March. The game, which was originally intended to be released on Wii U following a successful Kickstarter campaign, is a 2D, arcade-inspired adventure that sees players jumping, shooting, and taking on giant bosses to acquire their powers in a world that has been invaded by monsters. 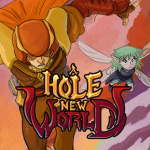 A Hole New World throws you right into the fray; with no tutorials or 'easy mode' options, and consisting of a simple two-button approach used to jump and shoot, you'll instantly find yourself neck deep in the nostalgic action, relying on your companion and potions to help you. The game has received generally positive reviews on other platforms, and could well be a nice little addition to the Switch's eShop. Will you be exploring A Hole New World when it launches on 1st March? Let us know your thoughts below. Castlevania much? But this looks quite cool! Everyone will play this in portable mode and flip the switch head up and head down. A Stranger Things/Castlevania mashup? Interesting. . . This looks pretty cool. Definitely on my watch list. Very Castlevaniaish but looks nice! The new Shovel Knight DLC looks good. hmmm interesting I'm watching and will wait on reviews of the game when it comes out. A Castlevania NES inspired indie? **money begins floating out of wallet** Wait wait I have enough platformers to play come back! Looks like the type of games I like...on wishlist for now. The gang that kidnapped Haggar's daughter in Final Fight is making games now. Cool! If it is $7.99 or less I am in! Yet another pixel art platformer with a gravity gimmick? @Panopticon Would it help to detach a joycon and hold it upside down? This wasn't on my radar, but I felt like playing something new, so I checked out the eShop and it caught my eye immediately. I beat it in about 2 hours, most of which I spent on beating the final boss. Graphically, the game is pretty good, the animations and backgrounds are nice and so is the music. I wouldn't really call the game hard - it's actually quite forgiving (restarts you where you died, game overs send you back to the last checkpoint you passed) and the only really tough part was the final boss. Unfortunately, the level design is a bit lacking and the upside-down gimmick is underused in my opinion. But still, not bad, I don't regret getting it. Wish Joymasher would port Oniken and Odallus: The Dark Call to the Switch (and hopefully the upcoming Blazing Chrome too).